Beginning Sunday and continuing through January of 2017 all Mindfulness Meditation Centers classes and retreats will have talks and meditations completely focused on the practices of loving-kindness and compassion. I will personally lead all classes and offer very special heartfelt, elegant and sacred instructions that were privately shared with me by root teacher. All are welcome to attend live, on-line or by recording. The sacred instruction will culminate in late January with an ceremonial offering of the Bodhisattva Vow - which is a commitment to help all sentient beings until the end of suffering - for all whom wish to receive. These classes will focus on giving up on the primary historical enemy of love and compassion: egotistical self-interest. There's nothing from which the world could profit more from then for each of us to try and release self-cherishing. A man who no longer thinks in terms of winning and losing is truly a non-violent man, since he will remain above all conflict. 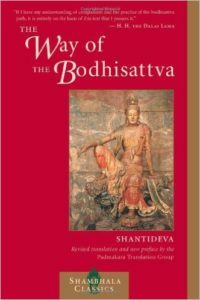 The only text required for the next few months will be the 8th Century classic, "Guide to the Bodhisattva's Way of Life," by the awakened Buddhist master and poet Shantideva. The link for this specific edition of this text is here. Live in person or on FB or Zoom at 10:30 EST from sunny Sarasota, Florida. If watching on Facebook please turn your volume all the way up on your desktop or mobile device. Please have a pen and notebook available. The classes can be seen in person from Prana Yoga 3840 S Osprey Avenue, Sarasota 10:30-12:30am (donation only, $15 recommended and tax-deductible).